There are several reasons you may be looking to have transcription services performed for your business. You may have lengthy interviews and presentations to transcribe,or you may need subtitling of your corporate videos. Whatever your transcription needs are at the time, there is a strong argument to have them transcribed by US based transcription services. For starters, you want the highest quality transcription for your business recordings. Using a transcription service that boosts English-speaking transcribers just may not do your company’s documentation justice. There is a strong difference between a US based transcriber and an English-speaking professional transcriber. With a US based transcriber, not only is English their native language, but they understand the nuances of the language as well. There are no translation losses with your company communications as they are able to understand slang terms and references that are only used in the U.S.
Non-US based transcribers may have a good grasp on the English language,but they may miss those subtleties that can make a difference in the meaning of your message. 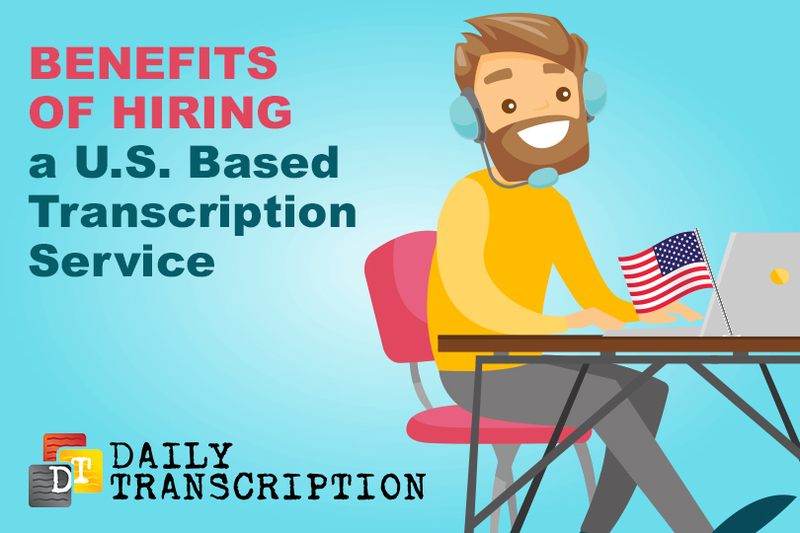 While you may be tempted to go with a cheaper transcription service that does not use U.S.-based transcribers, you should be aware of the quality of transcription you may end up with. Using a U.S. based transcription service can also provide you a more consistent transcription of your company communications. There will be an easier flow to the language and more understanding of the message being conveyed during the transcribed recording. From one transcriber to another, there are differences in the way that they interpret the spoken word. This can cause variances in your documentation that can change the meaning of your company message in a way that was not fully intended initially. Using a U.S. based transcription service can help to retain the quality of your company communications. From U.S. based transcriber to another, there is a solid understanding of the English language and the references that are innate to the spoken word. While non-native English speakers can provide a transcription of your company recordings, they may misinterpret the meaning of a word because it is not native to their understanding of the English language. Even English-speaking countries such as the U.K. and Australia can have differences in word use that could alter the way that your company message is perceived. With a U.S. based transcription service, you can also cut down on the number of errors that occur throughout your company communications. English-speaking transcribers can easily misunderstand the meaning of a word, giving you a false transcription of what was actually said in a conversation or presentation. Having an accurate account of an interview, presentation or recording is of great importance for your business. You do not want to take the chance of losing your company’s credit ability with a transcription service that gave poor results, making it imperative that you select a transcription service that uses only U.S. based transcribers for your company’s transcription projects. You do have a choice when it comes to selecting a transcription service for your business. Daily Transcriptions offers U.S. based transcribers that can provide accurate transcription services for all your company communications. Contact us today to see what we can do for you.